There are certain talents all backpackers inevitably acquire on the road. How to hike a volcano in your flip flops because you lost your running shoes, for example, or how to find the @ symbol on a keyboard set to a different language input (hint: Google it and copy+paste). While many of these abilities are learned as needed, there are vast opportunities for those actively seeking to expand their knowledge while out and about—or at least replenish some of the brain cells they drowned with 70-cent shooters or vodka/Red Bull buckets. Single-day cooking courses focusing on regional cuisine and dive shops offering PADI-licensed certifications are available more or less worldwide. Likewise, language schools are a fantastic occasions to enhance your experiences abroad. In areas such as Southeast Asia and India, you can squeak by with minimal knowledge of the native dialect, i.e. “hello,” “please,” “thank you” and “delicious.” However, it is extremely difficult to travel throughout Latin America without at least transactional Spanish. I realized this after accidentally embarking on a six-hour chicken bus* ride to not only the wrong town but also the wrong country. Aye carumba indeed. *chicken buses are local buses named as such due to the seemingly ubiquitous presence of said flapping, squawking livestock being transported to and from the marketplaces. While Spanish schools are abundant across the continent, San Pedro La Laguna is one of the most popular hubs as classes are argued to be the cheapest on the planet. San Pedro is the apex of a quaint Mayan village steeped in indigenous tradition and a hip traveller epicenter buzzing with backpacker dynamism. Locals typically speak to one another in Tz’utujil and most women wear traditional attire. Many people are deeply religious and the sound of Christian hymns is almost as pervasive throughout the cobblestone streets as that of rooster crows. 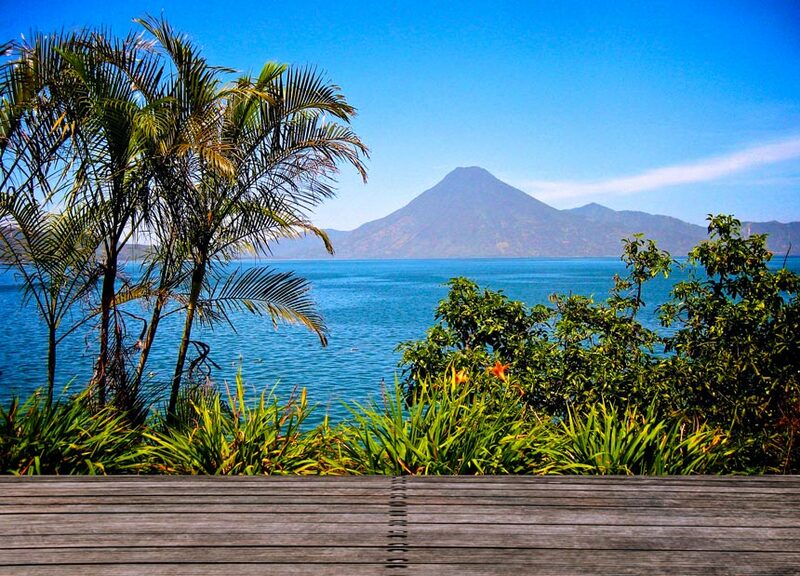 Simultaneously, the fecund volcanos where meandering clouds snag and tear and the gentle waters where fishing boats bob and putter make Lake Atitlán one of the most sought-out backpacker destinations in Central America. In fact, many indie travelers who primarily intend to spend just a few days hiking or kayaking find themselves so smitten by the lake’s tranquil beauty that they repeatedly postpone their departure. Henceforth, a number of Spanish schools have opened to cater to this languidly dawdling crowd. Two of the most reputable schools in San Pedro are Orbita and Casa Rosario, both of which offer one-on-one instruction for three or four hours per day. The differences between the two lie in their respective teaching styles: Orbita students adhere to a strict lesson plan that includes worksheets and tests while Casa Rosario students follow a more informal approach comprised of chat sessions with their instructors. At the time of writing, 20 hours of classes per week costs $80 USD sans homestay and $140 USD with homestay at Casa Rosario. Orbita prices are $98 USD and $160 USD, respectively. Having never been an academic overachiever, I opted for Casa Rosario—especially because the “classrooms” consist of modest desks sheltered beneath wooden awnings nestled amongst lush ambrosia—and am pleased to report a wholly enjoyable experience. My teacher Esther and I are the same age, and bonded quickly over our cultural similarities and differences. She explained the routines, expectations and nuances of a traditional Mayan life while I explained how Instagram works. Occasionally, we took field trips to neighbouring San Juan or Santiago to sightsee or shop. When I acquired a stomach parasite, she accompanied me to the clinic and we held our lesson in the waiting room. Although her English (like that of many of the Spanish teachers) is rudimentary, she was able to succinctly explain grammatical rules, and had a dual language dictionary on hand for when she was unable to describe or act out a word’s meaning. Studying in San Pedro comes with the opportunity to do a homestay with a native Mayan family. While many students are thrilled to live within a Tz’utujil household, enjoy local cuisine (which is predominantly tortilla-based) and tag along on daily excursions to church or the market, some are overwhelmed with the pressure to speak Spanish all day or feel uncomfortable returning late and intoxicated from a night at the bar (as mentioned, San Pedro is extremely devout and most locals abstain from alcohol consumption). Before deciding on whether a homestay is right for you, consider what sort of overall experience you are seeking. Most students take classes from 8 a.m. until 11 a.m. or 12 p.m., allowing for chilled out afternoons on the lake. Kayaks are available for rent (or for free if you are a student at Casa Rosario) and are best for exploring the abandoned homes which are partially submerged due to the rising lake water. Additionally, the San Pedro volcano makes for a rewarding if intensive hike; be sure to bring a buddy as well as lots of water (and ideally not your flip flops). Traditional weaving courses are offered in the artisan community of San Juan while yoga and meditation classes are abundant in the hippie oasis of San Marcos. If you yearn to delve deeper into Mayan culture, be sure to visit local deity Maximón in Santiago. Being constantly on the move means many backpackers burn out at one point or another during their trip. If you’re craving an excuse to settle in one spot for a while, then consider signing up for language school. Whether you’re intending to become fluent enough to engage in rich conversations with locals or just pick up the basics to make sure you’re clambering onto the right chicken bus, San Pedro La Laguna is an idyllic place to hone your Spanish skills.